Ethical investing is big business. But do you pay a performance penalty for doing good and what's ethical anyway? John Addis investigates. Ethical investing is only for the naïve, right? With the carbon tax dead and the renewable energy target for the chop, Australia's renewable sector is going the way of the dodo. What's the point of paying more to get poor performance from an ethical investment fund in an environment like that? Well, things aren't quite as they seem, although a run down the list of Australia's top 20 stocks highlights the problems ethical investors face. Woolworths, one of Intelligent Investor Share Advisor's long-standing buy recommendations, delivers high quality food at reasonable prices. With a volume-based business model it passes on cheaper prices to customers and supports local schools and community groups. But Woolworths also happens to be Australia's largest poker machine operator, sucking in the savings of pensioners and encouraging gambling addiction. Then there are the 'healthy' breakfast cereals that contain 30% sugar. What about the banks? The financial planning scandal counts Commonwealth out. Meanwhile, ANZ Bank is providing a $1.2bn loan facility to Whitehaven Coal for its vast Maules Creek development, an open cut coal mine on the edge of a national park that will produce carbon emissions equivalent to those of New Zealand. NAB and Westpac were last year rated among the world's most ethical companies, but so was Alcoa, an aluminium producer ranked the 15th biggest airborne polluter in the United States. And both these banks make loans to coal and coal seam gas developers. Even resources stocks like Rio Tinto and BHP Billiton pose problems. Mining stocks fail the ethical investment test but without the iron ore provided by these companies, could China have reduced poverty from one third of the population in 1979 to one tenth now? With so many top 20 stocks counted out, to build a diversified ethical portfolio you really have no choice but to include smaller companies. How about ethical no-brainer Cochlear? The company's bionic implants give hearing to the profoundly deaf but the company makes operating margins of over 70%. Wouldn't it be more ethical to lower the price and build a volume rather than a margin-based business? You can see the problems. One person's ethics is another person's foolishness and nothing in ethical investing is clear-cut, ever. To help it overcome these problems, the ethical funds management industry divides its investments into two types. If a company's activities detract from the sum total of human, animal or environmental happiness they're avoided. This 'negative screen' excludes alcohol, mining, gambling and resources stocks but include almost everything else. A 'positive screen' includes stocks that actively benefit society and the environment but leads to a portfolio heavily concentrated in renewable energy, recycling and healthcare, breaking the fundamental rule of diversification. Most ethical fund managers, especially those investing only in Australian stocks, thus end up with a combination of the two approaches. What about performance? The many international studies comparing the costs of ethical versus 'ordinary' investing suggests that, in general, if you do pay a performance penalty to invest ethically, it isn't large. And some studies indicate ethical investing actually aids outperformance. Ethical investing need not involve a performance penalty. The cost issue is more settled. Because ethical investing expands the research process to include judgments on the company's impact on society and the environment, ethical funds tend to be more expensive. Hunter Hall's Global Equities Trust, which employs a negative screen, charges an entry fee of 4% (all of which may be rebated), a management fee of 1.8% and a 15% performance fee of any return greater than the MSCI World Index. Against that, Perpetual's Ethical SRI Fund management fee of 1.175% and buy/sell spread of 0.15% seems quite reasonable. 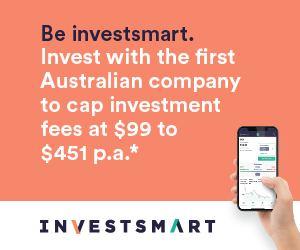 But investing in funds like these might be a better choice than trying to build your own Australian-based ethical portfolio. It's one thing to find an undervalued stock but quite another to find one that's cheap and socially responsible. Australia is a small market with a tiny renewable energy sector that, due to recent government action, is likely to get smaller still. Positively screened investing in Australia is therefore a more risky proposition than simply choosing local stocks that 'aren't evil'. If you do want to invest with a positive screen, Europe, the US and China all have more developed renewable and SRI sectors with more established, larger and growing businesses. With the Australian dollar still at comparatively high levels, now's a great time to invest in a global ethical fund where fees tend to be cheaper and investment choices broader. If you're ethically inclined and accept climate change as a global problem, why not bring a global perspective to it and profit at the same time?